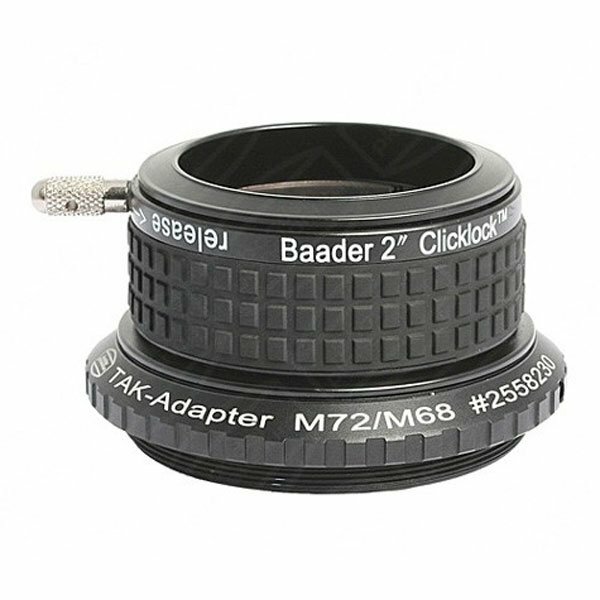 - The Baader 2" Clicklock Eyepiece Holder replaces the crude stock eyepiece clamp and gives Takahashi users the ultimate eyepiece holder for their fine refractor. - The eyepiece holder can also be detached from the M72 portion to expose M68 threads. This permits use of Baader's M68 Extension Tubes to enable robust and convenient spacing of the holder for adjustment of telescope back-focus. - Fits all Takashi refractors with M72 thread (FS-102, TSA-102, FSQ-85 EDX, FSQ-106N, FSQ-106 ED series, TOA-130S and F and TOA 150, FS-128, FS-152). Physical Length: 41mm.